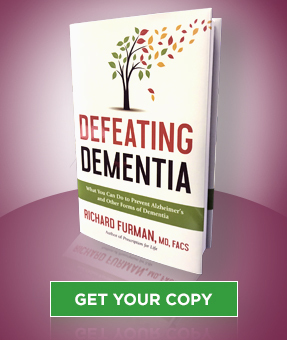 I (Dr. Furman) have been to many third world hospitals and have operated on people from many nationalities whose diets are different from most typical eating habits in America. Those experiences have taught me a great lesson. First of all, I noticed a marked difference in the type of operations I was performing. Back home, many of my procedures were on blocked arteries. I would open carotid arteries leading to the brain that were 85 to 95 percent blocked by plaque buildup, would clean out the plaque, and would close the opening I had made in the artery to do my work. On other patients, I would bypass complete blockages in the arteries going to the legs. I saw patients needing stents and bypass surgery on arteries in their hearts. In the United States, everywhere I looked, I found plaque. But in the remote areas of Africa, it was different. I will never forget performing an abdominal operation on an elderly man. He had extremely curly gray hair, and the skin around his eyes and mouth were wrinkled from his constant smile. He was thin. His wife was equally thin. (She also had a round piece of carved wood, the size of a quarter, in each ear lobe.) I say they were elderly because they, like most of the elderly in that village, didn’t know exactly what year they were born. All I can say is that he had to be in his mid-eighties. Once I began operating, I felt for his aorta, the largest artery in the abdomen. It was smooth as silk and so soft, I could hardly believe it. I felt further for his smaller arteries—and found the same thing. I felt for the small artery that feeds the small intestines, the artery that got my father. It was as soft and plaque-free as a newborn’s. I operated on another elderly African gentleman whose main artery to his leg felt as soft and pliable as a ten-year-old boy’s vessel. In all the years I operated there, I never operated on an artery that was plugged with plaque. I never saw a patient who needed a stent placed into their heart arteries—or a bypass operation. What makes their arteries so much different from those of the patients in America? Is it where they live? Is it their race or tribe? Or could it be what foods they don’t eat? It wasn’t until years later that I began reading about these people in New Guinea and certain areas of Africa. I read studies in the medical literature about how these tribal people had been evaluated for their cholesterol numbers. Their Total Cholesterol averaged around 150. At that level, almost no heart attacks ever happen. Arteries of such people are going to stay physiologically young for years and years. It was intriguing to realize that the two main sources of harmful foods in America were not available in these tribal areas. They didn’t have animal-based foods or dairy products. They didn’t have red meat and cheese. It was a strange feeling to begin understanding what I had seen as a younger surgeon. I started realizing that what protected those primitive people was their diet. It was also a strange feeling to realize that more than half of Americans are dying because of what we are eating. The tribal people in Africa don’t have our problems related to the arteries of our hearts and brains because they don’t eat the foods that damage those arteries. They don’t load their bodies with lethal LDL cholesterol. 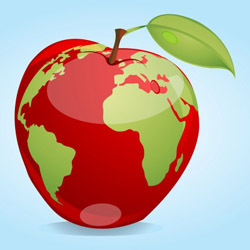 I became more interested and began studying more articles concerning other parts of the world where mainly vegetables and fruits are eaten, with basically no meats or dairy products such as cheese or butter or cream. I began to understand why I didn’t see any colon cancer and very little breast cancer in those parts of the world. I tell you this so, in your mind, you can begin placing healthy foods on one side of a scale, and unhealthy foods on the other side. You look at the scale and point to one and tell yourself, it will age you, and remind yourself the other will make you healthy. Granted, I would rather live in America than any other place I have ever visited or read about. But, with a little knowledge, you can have the best of both worlds. You can have the same good health for your arteries as they do in such third world situations, and at the same time enjoy all the privileges you have in America. 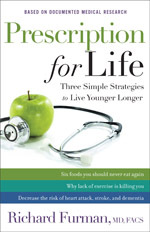 Discover the six foods you should never eat again in Dr. Furman’s must-read book, Prescription for Life.